The Volvo EC220DL at work in Al Khor. Volvo Construction Equipment (Volvo CE)’s full line of hydraulic breakers has been steadily gaining popularity since its launch in Qatar’s booming construction equipment market, where tough ground conditions are a frequent challenge for contractors. The country, served by Volvo authorised dealer Araco, is currently the single largest market for Volvo breakers in the Europe, Middle East and Africa (EMEA) region. One of its many satisfied Qatari customers is Al Ghebra Trading and Contracting. 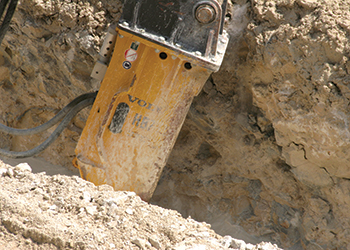 Founded in 2010, the company acts as a subcontractor to major contractors such as Generic Engineering Technologies and Qatari Diar-Saudi Binladin Group (QD-SBG), on jobs suitable for excavators equipped with a breaker or bucket – primarily ground preparation for pipelines, buildings, roads and tunnels. Currently, Al Ghebra is working together with other subcontractors on ground preparations for a naval base in Simaisma, Al Khor, in the north of the country. Its operators are tasked with creating 5- to 6-m deep and equally wide shafts for water and sewage pipes in the dense and abrasive limestone ground material. Work continues for 10 hours a day, seven days a week. Al Ghebra took delivery of its first Volvo HB22 breaker together with a Volvo EC220DL excavator in July 2015. After working just one month on the tough Simaisma site, the performance of the Volvo HB22 breaker convinced owner Mohamad Alabdalah to purchase a further four Volvo excavators, all with Volvo breakers attached. “The Volvo brand has a good reputation for quality and I wanted really good equipment. 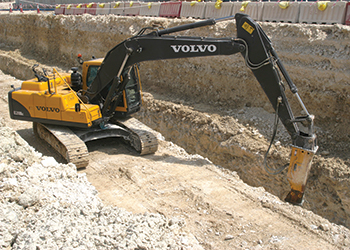 Then Volvo CE’s dealer in Qatar, Araco, offered a bundled deal for the excavator and breaker. It was convenient and cost-effective to have the same supplier for both,” says Alabdalah. In action ... the Volvo HB22 breaker. Volvo CE delivers its breakers ready to use with hydraulic hoses, breaker brackets, maintenance tools, chisel, manuals and the breaker itself packed in a single crate. This is not always the case with other breaker suppliers where brackets and hoses may have to be arranged locally. Volvo breakers can be shipped either as part of a machine order or as a loose attachment. Al Ghebra foreman Nwab Khan is also a fan of the Volvo breakers. “I like the bended rounded corners on the housing. The previous breaker I used had four plates welded together for the housing. After some time, the welds started to crack and the breaker stopped working. The Volvo design is more durable. “The autolube ensures that the chisel is always properly lubricated and the operator can keep working instead of having to stop to go outside and grease the chisel. It is also convenient to receive parts and service support for both the machine and the attachment from the same dealer,” he adds. Al Ghebra has not required any technical support yet but has a good dialogue with Araco on how to plan the up-coming services. Volvo Group is one of the world’s leading manufacturers of trucks, buses, construction equipment and marine and industrial engines. The group provides complete solutions for financing and service.